Welcome to part two of our March 2019 Inspirational Interview with Dawn Wilcox, founder of Women Count USA. In this part of the interview, Ms. Wilcox talks about what men and boys can do to help end violence against women, shares some advice to activists, groups, and organisations thinking about starting similar databases, and her plans for the next 5 years. 6. What would your advice be to activists and organisations in other parts of the world who wish to start similar databases in their countries? I would strongly encourage them to do so. I was pretty shocked no one in the government was already doing what I do. I believe this work must remain at a grassroots level and undertaken by people who care deeply about male violence against women, and I am not sure the government is up to the task. For example, the government initially reported the death toll for Hurricane Maria in Puerto Rico was 64. We now know it was approximately 2,900. I am also willing to teach people in other countries how to do what I do. 7. How do you think men and boys can help to end violence against women? They can help by not taking activism about this issue as a personal insult. 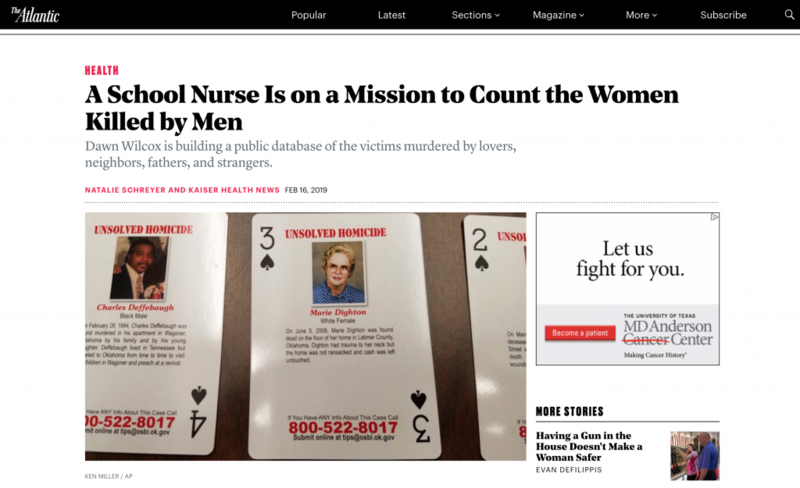 When national news stories about my work documenting women murdered by men was published in February, the overwhelming response from men was negative. Only 8% of the followers on my Facebook page Women Count USA are men. Men can help by refusing to participate in the misogynistic comments and actions that dehumanise women and girls and create an environment where men see women as valueless or less than men. They can also help by challenging other men’s hate speech about women. The first step to killing people is othering them and stripping them of their humanity. Femicide is the last stop on an escalation of sexist behaviors and ideas. 8. What are your plans for Women Count USA in the next 5 years, and do you have any other anti-violence against women initiatives in the pipeline? I plan to continue creating databases of women murdered by men going all the way back to the 1950s. Due to the overwhelming number of cases, this will be a lifetime effort. I want this information to serve as a remembrance of women and girls who lost their lives to male violence and as a resource for researchers, academics and domestic violence educators. I also plan to present my work to lawmakers in hopes of encouraging them to increase funding for violence against women and enact meaningful legislation to protect women and girls. In my dreams, I could somehow have people who care about this issue crowdsource a decent salary so I could do this full-time. 9. How can The Pixel Project’s supporters engage with and support Women Count USA? Supporters can email any cases of women or girls murdered by men to me at womencountusa@gmail.com with the year she died in the subject line. Please include news link, if possible. I do this work on a volunteer basis in addition to working full time. There are costs associated with hosting a site for all the women’s photos, for a future website domain name, and for conferences such as the Crimes Against Women Conference in Dallas in April 2019 where I will learn additional tools and share my work. Any support is welcome at my Patreon page. 10. In your considered opinion, how can we end violence against women for good? By understanding violence against women occurs on a continuum. Sexist ideas, speech and the normalisation of attitudes that women are the property of men lay the groundwork for the dehumanisation of women – which is the foundation of violence against them. Male violence against women should be prosecuted and punished as vigorously and harshly as the same crime would be if the victim were a stranger – and regardless of whether a woman is willing to testify against her abuser. If we can prosecute murder without the testimony of a victim, we can do the same with domestic violence, especially when there are often injuries to speak for themselves. When women go to police for help they need more than a piece of paper which is often violated by the abuser. Women’s rights in the United States must also be finally included in the Constitution by passing the ERA (Equal Rights Amendment).